The PC Financial World Elite Mastercard is best for people who shop at PC Stores, Esso and Shoppers Drug Mart. Rewards are easy to redeem and have a low minimum. When it comes to targeting grocery spending, the MBNA Smart Cash and the Scotiabank Momentum Visa Infinite are my favourite cards in Canada. The PC World Elite, however, is one that will really challenge these 2 for wallet space. For people who shop at PC stores, this card is going to be quite valuable. It earns the highest return for Shoppers Drug Mart spending and the 2nd highest return in the Canadian marketplace for spending at most of their grocery stores. It also comes with a nice per litre bonus for Esso gas purchases. Finally, it offers the insurance coverages and benefits that all other World Elite Mastercards have, but there is no annual fee on this one. This card definitely is going to have value for many people who do their grocery shopping at PC stores with some regularity. Personally, I have been moving my grocery shopping over to Real Canadian Superstore (a PC grocery store) and have been paying for my groceries with my MBNA World Elite card that earns me 2% cash back. I will be getting this PC Financial World Elite Mastercard and it will earn me 3% return on my Superstore purchases. The rewards earned on this card are PC points. Points can be redeemed in 10,000 PC points ($10) increments, with a minimum 20,000 PC point ($20) redemption. Redeeming PC Points is very easy. When checking out at any PC store, such as No Frills or Loblaws, simply ask to redeem your points. They will be used to pay part of the bill and will come off like a gift card. The only issue I can even think of with this is that I wish they would have made the PC Points act like a coupon. This would save the consumer the sales tax on the redemption amount. This is a minor issue and these act the same way as all the cashback programs (taxation wise). I guess this would have been a nice to have. 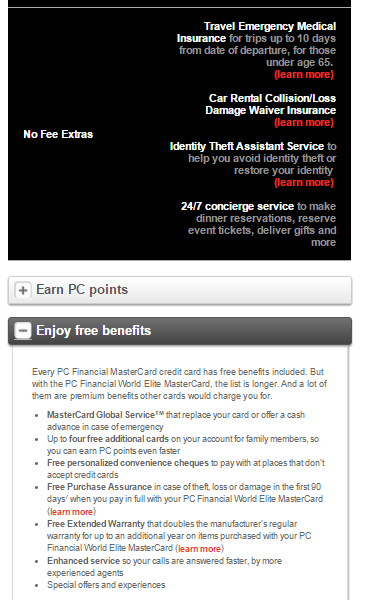 The PC financial World Elite Mastercard pays 10 PC points / dollar on all purchases everywhere. It also privileges various other purchases, including PC related products (PC grocery stores, Shoppers Drug Mart, PC Mobile, PC travel), and partners (Esso). Something to note is that the per litre earnings at Esso are in addition to the 10 PC Points / Dollar spent there. At the $1 / Litre regular gas price, this works out to a nice 3% return on regular gas. As gas prices go up, this percentage will decrease. Another huge benefit is that this also privileges purchases at PC Travel. Assuming that PC Travel is not more expensive than another mode of booking (my quick searches indicate that PC Financial had the same price as Westjet.ca), this is a very high return for travel purchases. I believe that only the TD First Class credit card gives a better rate of return for travel purchases booked through their travel agency. The PC Financial card is really the card for people who spend a good amount of money at PC stores. My understanding is that No Frills stores accept only Mastercard, while the other brands (Loblaws, Superstore, Zehrs etc.) acceptMastercard and Visa for payment. None of these stores accept American Express. The cards that I’ll use to do the comparison are those that can be used at PC stores only. The 2 closest cards would be the MBNA Smart Cash and the Scotiabank Momentum Visa Infinite. The PC card most easily lines up against the MBNA Smart Cash card. It is a no fee card and really privileges grocery store and gas purchases. The rate of return is 2% on gas and grocery (up to $1500 / month) and 1% on everything else. For people who chop at PC stores and fill gas at Esso, the PC Financial card is a much better card. Obviously, if groceries are bought elsewhere, the PC card is not a good card for you. The Scotiabank Momentum Visa is one that will give a better return at grocery and gas. The difference is the annual fee with the Momentum card. For many people that 4% on all gas and all grocery is going to be worth it. If you spend a significant amount at a non-PC grocery store or at a gas station other than Esso, there could be a lot of value in the Momentum card. Assuming your gas is at Esso and your groceries are from PC stores, though, it would require more than $9900 of spending (at Esso and PC stores) to make the Scotiabank card a better value than the PC Financial card, to offset the annual fee. The other wrinkle here is that Visa cards are not accepted at No Frills stores. If you are spending a lot at No Frills, then the Scotiabank Momentum Visa will not help you. There is no stated sign up bonus for this card. However, in reading Red Flag Deals forums, it appears that many people have received $20 worth of points as a welcome bonus. I would not be banking on getting these, but if they come it would be a nice surprise. According to this, everyone gets a $50 sign up bonus split into 4 coupons of 5000 points ($5 in groceries) and an additional 30,000 points on your first purchase. Personally, my approval came with a sign-up bonus of 4 coupons of 5000 points, so I can vouch for that. I have yet to see the additional 30,000 points in my account. As mentioned, there is no annual fee for this card. 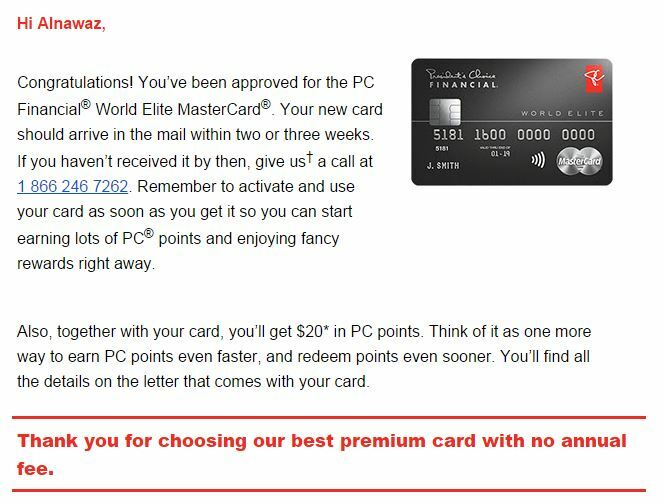 The PC Financial World Elite Mastercard is a great card for people who shop at PC stores and Shoppers Drug Mart. Due to its no annual fee, this card is a great card for people who spend any amount of money at either PC stores, Esso gas or Shopper’s Drug Mart. I just got this card recently. Great card and rewards. There is a $50 sign up bonus right now until Nov 16 http://www.pcfinancial.ca/whyjoin1b/ (only available to new customers). You get four 5,000 point coupons when you receive your card that you present in store (can only use one at a time), and another 30,000 points on your first transaction that is more than $50. Apply after and you still get the four coupons. I had the PC World MC and called as soon as I heard about the World Elite Card. I only used the World MC when I got groceries, and my Amex SimplyCash Card everywhere else. Now I use the WE MC at Superstore, Esso and Shoppers and will use it for travel as well, with the rest of my purchases on the Amex card. The PC travel site seems to be pretty good. So far, this card has been great and will pair well with my existing Amex card. The 30,000 points have appeared in my pcplus account, but have not been shown on my MasterCard statement. You also get a 7c per litre bonus at superstore gas stations (I believe it is in addition to either 1% or 3% bonus for shopping at a PC store). You forgot one little but important detail that this No annual fee, ALL-GOOD-2-B-True PC-Card requires people to have a minimum of 60k or 100k household annual income. Actually, I am not hiding anything, but I think if you are not satisfying the 60k requirement then thething to do is create a relationship with the bank on a lower card an then ask for an upgrade. yes, exactly, I have the reg. PC MasterCard..they are always after me to increase my credit limit etc..but when i applied for the Word Elite card apparently i’m not good enough..I’m retired now so my income is well under the $60,000 per year requirement & I live alone so my income is the household income..i spent about $1000/month on my card & always pay it off in full every month but they want you to charge a min. of $2000 month in order to get it..without having the min. income..I feel like cancelling my reg. card over this..just because someone makes $60,000 a year does not mean they will use the card even as much as i do or that they will make their payments on time..and just because my income is low doesn’t mean i don’t have money to spend because i do..I think a lot of loyal PC customers won’t qualify & that PC will alienate a lot of existing customers over this..do other feel upset & annoyed about not being able to get this card due to the high income requirement etc? ?Also calling in to PCMC is a nightmare..it is impossible to get through to a CSR..there is no option to speak to someone ..took me forever to finally speak to a person..I am tired of the lack of customer service as well.. Thanks for sharing. It is always good to have multiple perspectives on this. I am actually very surprised by this since this is not my experience with PC products. I am sorry they are very strict anbout that income requirement. I’ve been using my regular PC MasterCard for a couple years now and use it a lot. 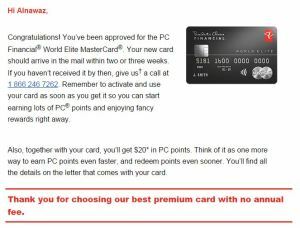 I have no where near the minimum 60K income but got at a call from PC to get a free upgrade to the World Elite Card from the standard PC MasterCard. I accepted and it has now replaced my old PC MasterCard and I’m earning more points than ever. Can you double dip with your PC points card (like aeroplan+ TD aeroplan visa at Esso)? Maybe you mentioned it but I overlooked it if so…. The PC points you earn are from the credit card, for the purchases you make that are charged to that card. If you go to ESSO, then you get the Aeroplan points from Esso for swiping the Aeroplan card, regardless of the method of payment. THose are 2 distinct steps, even though they are sold as a single thing (by TD). Please note: a minimum annual personal income of $70,000 or household income of $120,000 is required for this premium card. applied for the credit card twice. First time they said they lost the application. Applied again they said it wa denied as I had two applications. Then they renewed and said it was denied as my address was wrong. (they entered the address I gave them so they posted wrong city) I do not know what they want but it seems to be poorly managed, glad to not get involved with them as there could be problems down the road. PC master Card is horrible, I currently hold the world elite Master ca. Last month I make my payment on due date by PC banking on line. PC master said They received the payment Late and charge me for $118 interest. When I called they and want to show them the bank statement and ask they to waive the interest. I told to two people from PC master card. They said they do not care and have to charge interest. I told to my friend they said This happy to her before when she using TD Visa. But when she show the payment date to TD visa and TD waive the interest. The worst thing is when I tell them that they are service is horrible and I am going canceled the card. They said you can call in anytime to cancelled. So even I want told to their management I don’t have place to go. I suggest to everyone should go with big bank. do not use PC master PC. This is the worst customer service ever! They should be prohibited from doing business in Canada. Do not apply for this card. I have only had good expereince with PC Financial. Sorry your experience has not been as good. Would you care to elaborate on why you dont like PC Financial? Don't subscribe All Replies to my comments Notify me of followup comments via e-mail. You can also <a href='https://www.creditwalk.ca/comment-subscriptions/?srp=4397&srk=2648578ecea05c83754707575dc5a494&sra=s&srsrc=f'>subscribe</a> without commenting.